The UWC Foundation is a registered 501(c)(3) non-profit organization dedicated to helping children and families help themselves through partner resource groups and individuals that empower with life changing support. We believe that by supporting and educating women and children, we are empowering the very foundation that makes a happy and healthy society! We ask that you join us in our journey to make this world we live in a better place for all of us. 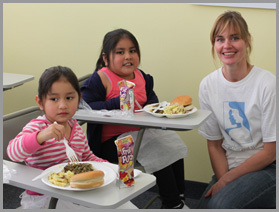 The UWC Foundation invited school children and their families to lunch this past Saturday, February 29th. We were able to visit with everybody and ask them where we could help. We did find out that the mothers have little support and do not communicate in English so we have already started to prepare english classes and computer classes for these women. The UWCF is planning events for this coming holiday season. We will keep you updated.